The capital city’s hotels are bulging at the seams. With occupancy rates at 78% according to hospitality consultancy company HVS International, hotels—especially four-star and above—are capitalizing on the tourism and business visitor influx, and raising rates quickly. The room rate has gone up 38.3% in the last year alone. The average room rate is now pegged around Rs9,705 a night plus taxes. As hotels in New Delhi become higher priced and overbooked, finding a place to lay your head here is more of a headache than ever. 032d8394-683a-11dc-86e4-000b5dabf636.flvBut savvy travellers are now turning their noses up at the large hotel chains and searching for hidden gems in the city: boutique hotels, bed and breakfasts or guest houses. Vikram Sharma, a New York-based businessman, often travels between India, Dubai and the US, establishing call centres for US companies. “When I used to come to Delhi in 2003, getting a room at a five-star hotel would cost around Rs5,000-6,000," he says. “Now I have to pay Rs10,000 minimum." Since his job requires him to stay in New Delhi for months at a time, he was fed up of the skyrocketing costs. A friend referred him to On-the-House, a bed and breakfast in South Delhi. “It costs Rs2,500 a night and it’s a great place to stay. The caretaker is a chef and cooks breakfast for me. I don’t even want to stay in one of the five-star hotels any more." Sharma is not alone. For the many frequent flyers to New Delhi, here are five spots, each with their own reasons, that will keep you out of the five-star hotels. What you get: AC, clean sheets, good water pressure, no Internet, dinner and breakfast included. Pay by cash or cheque. What you get: AC, clean sheets, adequate water pressure, Internet. Pay by cash or cheque. Booking: Call in advance at 91- 9811068234, though rooms can be available the same day. Longer stays are welcome. This small bed-and-breakfast holds the key to any businessperson’s heart: fast, wireless Internet. At no extra cost, patrons can sign on to the Web on their laptops and spend the night preparing for the next day’s meeting. The second-floor flat, with three guest rooms, can feel a bit cramped in the living/dining area, but the bedrooms are spacious, with room for a seating area, a desk and a bed. After a nightcap in the main room, guests can slip away to their rooms to work, watch television or sleep. 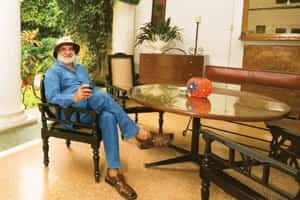 The rooms have few frills, but the owner, Aradhna Lanba—who is also an interior decorator—has recently redone them in bright, cheerful colours. The bed and breakfast also has a well-stocked bookcase, obviously chosen with care. And, if you really can’t sleep, you can play Monopoly or checkers or dominoes from the toy closet. The whole place has the feel of your friend’s mother’s home, with family portraits on the wall, and lace doilies on the chairs, but if that’s the case, the mother keeps out of the way and lets you unwind as you see fit. The only downside of this is that some single women may feel a bit uncomfortable without the safety of multiple guards or guests. The price of a single room is Rs2,500 and a double, Rs3,000. What you get: AC, no top sheet, average water pressure, fast Wireless, breakfast included. Pay by cash or cheque. Booking: Call in advance at 91-98110 47414, and do mention the time of arrival. If you are likely to check in past 10pm, the caretaker must know, so he is awake upon your arrival. When a place does little advertising and everyone still talks about it, you know you’re on to something good. French owners Alexandre Lieury and Mathieu Chanardof also own the Amarya Haveli, a Hauz Khas hotel. They started the Amarya Garden as another option for visiting friends, but word soon leaked out. While still in the same price range as many five-stars, this building offers large bedrooms, each with its own decorative theme, with wireless Internet, flat-screen TVs and attached modern bathrooms. The furniture and textiles have been carefully chosen by an interior designer to create a young, hip, elegant look—much more happening lounge than guest house. A large living room, done in bright pinks, offers reading material such as Marie Claire and Time Out. After the rains, the garden will reopen, with seating areas and a large outdoor bed. 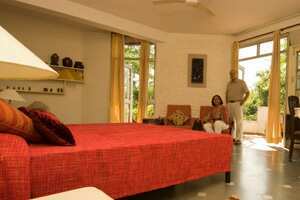 A single room runs to about Rs7,400 and a double to around Rs8,400. What you get: AC, clean sheets, good water pressure, wireless. Pay by credit card or cash.